As long as she wins, we win. It’s been interesting to see the difference between aggregate based sites, model based sites and the rest. KY/IN/VT called. All as expected. No surprises. WV called for Trump as expected. Sigh. 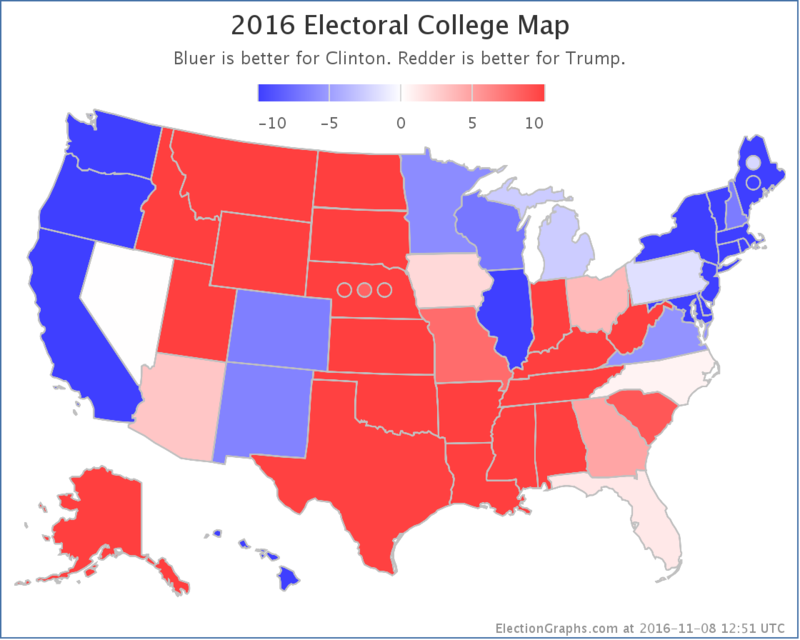 Pundits on TV flabbergasted by election were clearly not looking at electiongraphs.com. 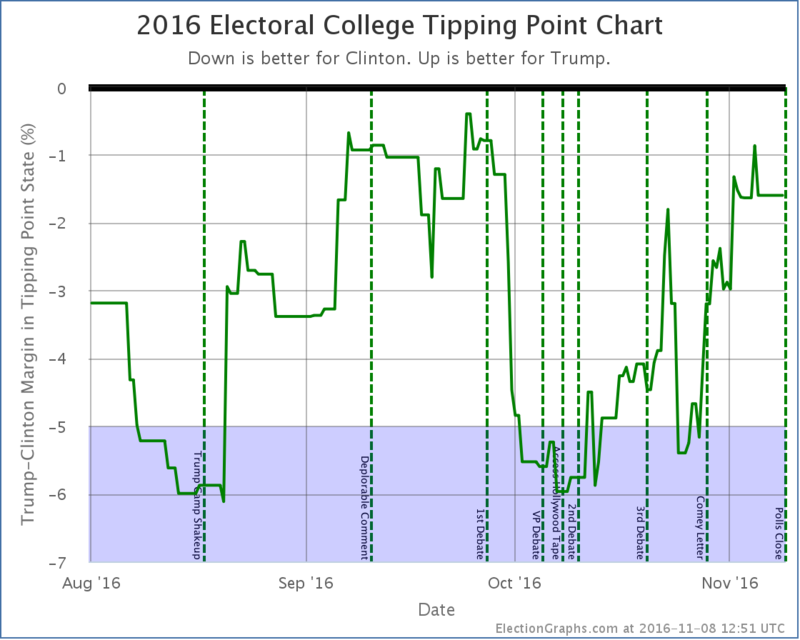 Though we didn’t want to accept it, abulsme correctly modeled nearly every state, and his tipping point showed how not only was this election on a knife’s edge, but that Trump was coming in with an upward vector. The data was there, but I preferred to believe that some pollsters were malicious or at least incompetent before believing that the American people would do such a thing to their own country. I expect jokers like Duterte and Berlusconi in places like the Philippines and Italy, but this is America. We’re better than that…. 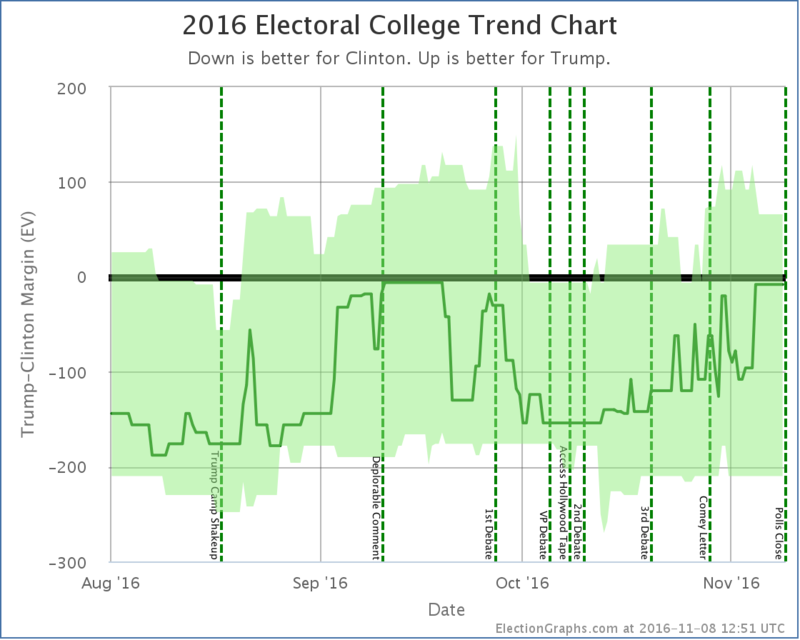 One thing I’m surprised at is how none of the talking heads on TV mentioned the Comey letter, but, looking at electiongraphs.com, you can see a dramatic correlation where the election took a U-turn. There’s a widespread belief that it didn’t hurt Hillary. I disagree, maybe it didn’t sour anyone on her, but it motivated and energized Trump and his supporters. If we had held the election the day before the Comey revelation, I think we’d have had a different outcome. A friend of mine suggested that it wasn’t the original letter that was the problem. Rather it was the second letter closing the investigation..again.. It played into the whole corruption theory, with the speed and so on of looking at 650,000. I’m following results where states are being called with projected results. Now, in the UK a constituency is not called until votes have been actually counted and announced. So there are no outstanding votes. Are all these still counted? Even after a candidate concedes or a result is projected? What happens if those votes flip a state? I seem to remember it happened before in 1960. Or worse, what happens if it flips a couple of states? Would that suddenly change the president elect? Or would state electors have to vote another way? I’ll be clear, I’m not grasping at straws here, but looking at some close results and wondering what would happen! Richard, it is the media “calling” the race when it looks like the result is virtually certain. The official counting continues until everything is counted, and there is a certification process that often takes weeks before things are fully official. And then of course for president, the electors have to actually meet in December and vote, and they can and sometimes are faithless. So there is a whole process yet to follow. The media just lets people know when the outcome is very unlikely to change. If in fact the final outcome is different when the counting is done, then that is the outcome, even if the person who thought they were losing conceded. At that point typically they would say “Guess I won after all!” and the other person would concede. Or, since any case where that happened is likely to have been very close, a series of appeals, recounts, etc might ensue. Ah, that’s fair enough. It’s a little confusing to find details. It was the bits between election night and actual elector voting that were a bit of a mystery. Given the margins in some states, I wouldn’t be surprised if some result changes end up with the winner getting a Florida 2000 kind of margin! Not enough to flip anything necessarily, but enough to show how close this was in reality. 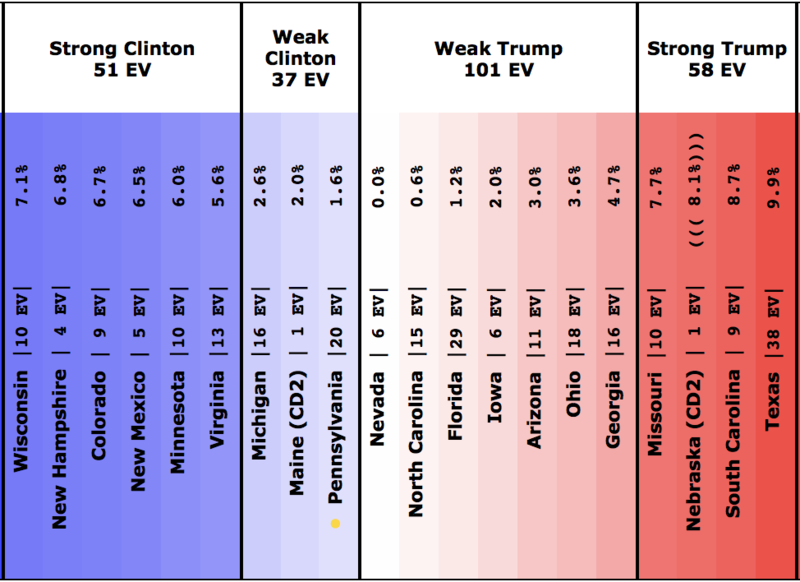 Especially as, in another 2000 parallel, it looks like there may be a split between the popular vote and electoral college.